North Carolina has a limited history of Amish settlement. Today, a single church district is found at Union Grove in the western part of the state. North Carolina is not known for having a large Amish population. Amish have attempted to settle NC on a few occasions in the past. Today, only one Amish community survives in the Tar Heel State. The Amish community at Union Grove, a small village west of Winston-Salem, was founded in 1985 by New Order Amish from Guthrie, Kentucky. The Union Grove settlement, like the Guthrie settlement from which it originated, is unusual in that it allows members to tap into electricity from the public grid. Amish here use the horse-and-buggy, wear plain dress, and speak Pennsylvania German, but belong to the tiny percentage of Amish which permit public power (comprising roughly 1/3 of the approximately 60 New Order congregations in North America). The New Order churches of Holmes County, Ohio, for example, for the most part do not permit electricity in the home. Amish settlers to Union Grove were welcomed by the NC natives. One Amish commenter reflected that it may have been because of positive connections locals had with Amish due to visits to the Lancaster County settlement. The Amish newcomers were visited numerous times by non-Amish, due to reasons of curiosity, and also by “seekers”, reports the Union Grove settler. Union Grove has not changed much in size over its quarter-century of existence. Today the community remains a single church district in size. Amish in Union Grove run a number of businesses, including a dry goods store and a shed-building business as well as outdoor and indoor furniture businesses (read more on Amish furniture in North Carolina). A decade after Union Grove settlement was founded, Amish from Union Grove started an unusual community at Yanceyville, NC. Six Union Grove Amish families began the community at the Yanceyville location in Caswell County, about an hour’s drive northwest of Raleigh-Durham and the Research Triangle. The settlement was successful in attracting seekers, and quite a few ended up joining the Yanceyville community. At one point, half the church membership was made up of individuals of non-Plain background. Ministers at Yanceyville gave sermons in English. Members traveled by horse-and-carriage and dressed Plain. Eventually, however, due to the influence of another church, Yanceyville ceased to exist as an Amish community. The Yanceyville church was supplanted by a Beachy Amish congregation, which soon went defunct as well. Besides Union Grove and Yanceyville, (and one or two failed settlement attempts made by individual Amish), the only other full-fledged settlement in North Carolina came about in 1918. This community was located near Moyock in the area known as the “Dismal Swamp” in northeastern NC. The Moyock community survived a quarter-century before finally disbanding in 1944. Amish historian David Luthy gives the history of this fascinating settlement in The Amish in America: Settlements that Failed 1840-1960. The first Amish settlers to the Moyock area came mainly from Ohio. However, over its existence the settlement did attract Amish from a wide array of locations, including Montana, Mississippi, Kansas, and even Mexico. Amish were attracted to the unlikely region by Ohio land developers, who drained and improved portions of the enormous Dismal Swamp on the Virginia border. The settlement grew slowly. The land developer took pains to accommodate Amish settlers, constructing a boarding house where immigrants would stay while constructing homes of their own. The locale was nicknamed the “Amish Hotel”, and it was used by members of the community as a place to hold church and school as well. Luthy notes that the Amish had plans to build a churchhouse (an unusual intention for the traditionally home-worshiping Amish), but they were never realized. Amish here appreciated the deep black soil, and with good drainage, were able to make a living farming. Mint was a popular crop, and one Amishman ran a business distilling mint oil. Corn, peanuts, soybeans, and potatoes were among the other crops raised. An unfortunate hazard of the terrain, however, was the flammable nature of the dried swamp muck. Hunters to the area frequently started blazes by dropping lit cigarettes on the turf. “Once caught on fire, the soil would burn until the next rain,” notes Luthy (Settlements that Failed, Luthy, p300). Swamp mosquitoes pestered the Amish settlers as well, with an observer describing it as “a mosquito paradise” (Luthy, p300). 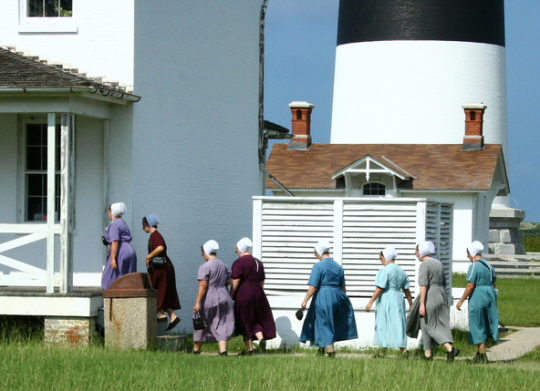 Thanks to a rail connection, the Currituck County Amish maintained ties with the Amish community which existed at Norfolk, Virginia at the time. Amish would travel by rail to sell farm products in the town of Norfolk, and also buried their dead at the Amish cemetery in this community. The settlement faced challenges. The main issue stemmed from the lack of spiritual leadership in the community. Amazingly, over its 25 years only one minister ever lived in the settlement, and then only for a short time. Ministers from other communities visited only rarely, and only one group of youth was ever baptized. The settlement seemed to experience a lot of turnover as well. Luthy notes the comment of one resident: ‘some came and others left all the time we were there” (Luthy, p298). The lack of spiritual leadership damaged the community’s long-term prospects. Eventually, Amish began moving away, with the last settler pulling up stakes and returning to Ohio in 1944. Today, not a trace exists of the Amish settlement that once existed here-no buildings, and since Amish were buried at the community at Norfolk, no graves either. North Carolina has never attracted much settlement by the Amish. This may be due to a number of factors; perhaps its relative distance from other communities, or its particularly warm and humid climate contribute to deter potential Amish settlers. NC has seen nothing of the Amish influx into other states such as Kentucky, New York, or Missouri, which have attracted large numbers of Amish migrants in recent years. Today, land prices in NC would likely be a discouraging factor as well, particularly compared to prices in places like upstate New York or Colorado. Another factor may have to do with building codes, as one Amishman from the Union Grove settlement notes that they are stricter than in some other areas when it comes to constructing school buildings. Whatever the reasons, the Union Grove settlement remains the lone Amish community in the Tar Heel State, small but long-lived at 25 years in existence. I think Ellenboro is about 11 miles southeast of Polkville with both little towns not being far the the county lines. Not too far especially if they live between the two towns for a buggy or wagon ride to sell goods in Polkville. I mentioned the Amish to a facebook friend who lives in NW Cleveland County and she said she sees them out in buggies all the time, I would say it is most likely to be the same group. Al, if you see anything else in the Budget about this settlement would please post it. I live about an hour and half away but have family in Shelby so visit the area fairly often. For those of us NC that enjoy learning about and visiting Amish communities this is great news. Patty, I still had several other copies of the June Budget newspaper, so looked at them and discovered that there is a scribe from Polkville who is regularly sending in news to The Budget. In their letter in the June 7 edition, they reported that the Polkville Amish community is a small settlement of 10 families and stretches for approximately 15 miles from one end to the other. That would be a long buggy ride! I will share other interesting news from Polkville when I learn of it. Would greatly appreciate any information available on businesses near Iredell County, NC, like Union Grove or Hamptonville, NC that may sell and construct a traditional pole barn on our property in Cleveland, NC. We are near exit 45 and 42 on I-77, south of Statesville, NC. My contact info is jratchford92@gmail.com. Thank you in advance for any assistance you can provide. do I become part of the Amish and what do I need to know? Hello, my name is Hedvika Miller I’m an international reporter from the Czech Republic in Europe. I’m working on article about Amish People in America and would like to visit some families in North Carolina for an interview. Could you please help me what direction I should go or who I need to contact? Thank you so much for your help! I would really want to find an Anish community that I can buy hand made furniture directly from the Amish community. I would prefer that over buying from a reseller. We are looking to buy an Amish Pony. We live in Wake Forest NC. We have a piece of property that we’d like to build a small cabin on Hyco Lake. Not far from Yanceyville. I have a plan and an actual model to look at to duplicate. The original builders are located in IN and we would like to see if there is someone local interested in the project? It’s a 14’X32’ with 6’ front porch. Insulated windows bath with shower, kitchen and loft for two beds. Please give me a call. 336-662-7953. There are Amish communities Ellenboro and Hopewell, NC. None of them have phones. They are easy to find, especially on Saturday because they are parked along main roads selling.